Get ready for Valentine's Day and surprise your child with cute love-themed lunch box treats and notes and DIY Valentine's Day gifts. Your child can also make a set of valentines for the students in their class. From printable candy bag toppers to silly pun cards, there are tons of clever DIY ideas to make this February 14th extra special. Pack a special treat for your child's snack on Valentine's Day by filling a plastic bag with popcorn and sealing the bag with decorative washi tape. 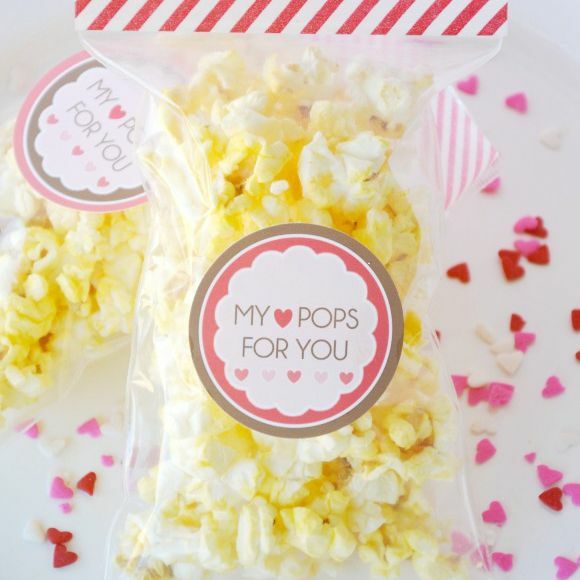 For the front of the bag, head over to Bird's Party and download the "my heart pops for you" bag label, which you can print out and tape to the popcorn bag using double-sided tape. Elementary-age kids are sure to shriek with delight when you surprise them with this adorable printable bunny box that you can fill with a small gift. To make the bunny box, download the free printable available at Mr. Printables. DIY monster valentines with cute printable messages, like "I'm wild about you" and "Wild thing you make my heart sing" are the perfect playful and non-traditional take on classroom valentines. To make your own set of monster valentines, download a copy of the printable bag toppers from Makoodle, which you can staple onto the tops of clear resealable food bags. Head over to a party store to pick up enough crazy straws for all the children in your child's class to make these fun and crazy owl valentines. Then, grab the free printable template from Happiness Is Homemade and punch two holes in the printable valentine for the crazy straw to slip into. Craft these clever "Valentine, you are just write" cards that come with a cute pencil (perfect for school!). To recreate this super easy to make valentine, pick up some fun patterned pencils and print the heart valentine available at Positively Splendid. Slip several of these funny jokes by Craftaholics Anonymous into your child's lunch bag this Valentine's Day to make their day extra special. If you are looking for an extra clever valentine idea, Bliss Bloom Blog combines Valentine's Day and the school theme with its DIY fish cracker treat bags featuring a printable background that says "Dear Valentine, I'm so glad we are in the same school". Fill small plastic bags with assorted red and pink colored candy to give to everyone in your child's class as a special treat this Valentine's Day. Visit Makoodle for complete DIY details on how to make your own Valentine's Day treat bags. Encourage your young child to play by giving them some homemade cinnamon-scented glitter playdough that they can use to sculpt to their hearts' content. To learn how to make your own playdough, follow the DIY recipe at Make Life Lovely. Transform ordinary snack-size packages of applesauce into a Valentine's Day treat with "You're awesome sauce Valentine" labels designed by C.R.A.F.T. The labels fit perfectly on top of the containers' foil wrappers. Fill small plastic bags with one toy dinosaur in each bag and print out a fun "Rawr! means I like you in dinosaur" Valentine bag topper, which is available for free at Simmworks. If your child would like to give out classic conversation hearts this Valentine's Day, make the valentines a bit more personal by filling small bags with some heats (purchased in large bulk bags to save money), printing matching themed bag toppers (available at Makoodle), and stapling them to the tops of the bags. 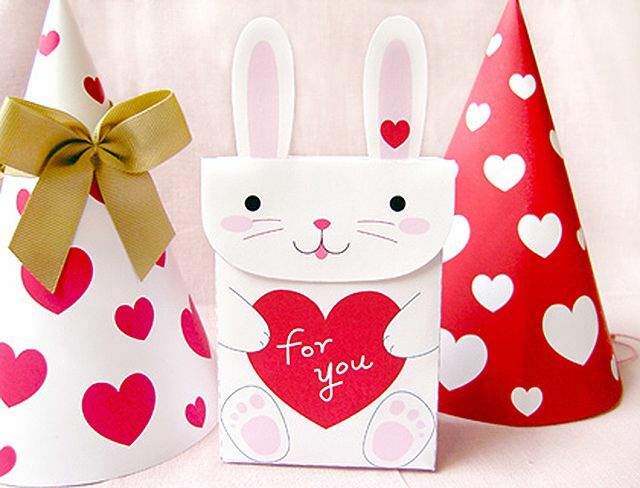 Let your child help make a set of Valentine's Day treat bags for all their friends, using a heart punch and decorative cardstock. The full DIY instructions for the treat bags can be found at Nobiggie. Younger children will squeal with happiness when you give them a set of pig toys that "kiss" when the magnets at the ends of the noses of the pigs are put close together. Make your own set of soft and cuddly romantic pigs by following the tutorial at Craft Passion.